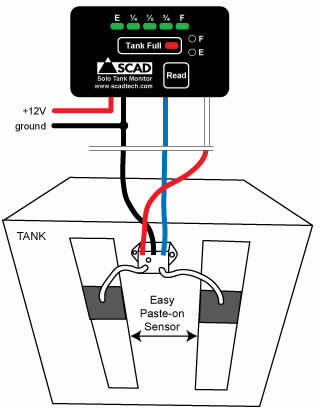 SCAD SOLO Tank Monitor System (Tank Full or Empty) and external non-contact sensor attaches its sensor to the outside of your plastic or composite tank. Using a foil tape (2in x 3.5in), it connects to the Solo display panel that you can locate anywhere on board. At a glance you will know your holding tank's level of fill.It will alarm at Full condition indicating its time to empty. Installation is easy since the tank sensor tapes mount to the outside of your plastic holding tank and can't be fouled. Just cut the tape to the vertical length of your tank and set the empty and full calibration points on the Solo's monitor panel. Calibration is kept even when power is removed. Once the system is installed, it will automatically check the tank level periodically. When the tank is full, a red LED will illuminate indicating the full tank or you can check the level at any time by pressing the \"Read\" button, which will illuminate the bar graph indicating level of full. 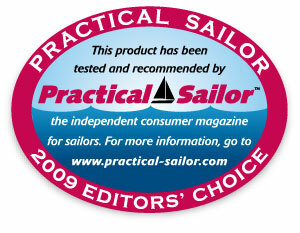 The SCAD Profile Solo tank monitor uses only .001 Amps when powered on. An optional sensor for metal tanks is also available. The clog-proof floatless sensor fits inside a metal tank and easily installs by simply cutting to length the sensor to adapt to any size tank. 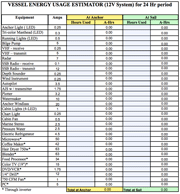 The tank monitor is also compatible with nearly all sensor types available on the market today making it easy to retrofit into an existing tank system or to install new. This display panel also features an optional tank full light which can serve as a \"Do Not Flush\" light when installed in your bathroom. Panel will monitor liquid level on 1 tank. Panel size: 3.75in. x 2in. Data is displayed as a 4 position LED bar graph. Simple to install, setup and operate. Compatible with both capacitive level sensors and 240-33 Ohm float sensors. Features exclusive EZ-Profile software algorithm which corrects for odd tank shape and sensor type.